News of Thai protesters occupying several government buildings in Bangkok reminded many of similar provocative rallies which shook the nation’s capital in 2008 and 2010. Indeed, one way to analyze how the current crisis will unfold is to review how various political forces reacted in the past. In 2008 the People’s Alliance for Democracy (PAD) or Yellow Shirts conducted daring street actions for several months to force the removal of the elected government, whom they accused of being a proxy of ousted Prime Minister Thaksin Shinawatra. Thaksin was removed in a coup in 2006 but his party has remained victorious in the polls. PAD adopted the color yellow as its protest color in honor of King Bhumibol Adulyadej, the most revered figure in Thailand. PAD was able to occupy Government House in August. Protests continued until September when the group was able to disrupt railway operations and flights at Phuket International Airport. PAD upped the ante in November when they were able to surround the parliament building. They also paralyzed air travel in the country by occupying Bangkok’s two major airports. PAD withdrew from the airports after eight days when the country’s top court ordered the dissolution of the ruling party, which forced the prime minister to step down. Further, the court disqualified allies of Thaksin from running for public office again. The victory of PAD led to the rise of the Red Shirts, who adopted the color red just to differentiate themselves from the Yellow Shirts. 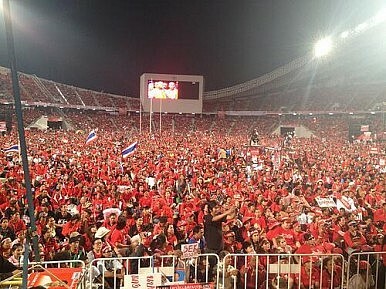 The Red Shirts were neither leftists nor anti-royalists, but many of them were supporters of Thaksin. They were vigorously opposed to the government of Prime Minister Abhisit Vejjajiva whom they denounced as illegitimate. The Red Shirts adopted the tactics of their yellow counterparts in order to undermine the administration. They often mobilized in the streets in 2009 to call for a new round of elections. They even stormed the summit of the Association of Southeast Asian Nations. But it was only in early 2010 that they were able to occupy various parts of Bangkok. Next, the Red Shirts established protest camps in the city as they pushed for the resignation of Abhisit. After two months of protesting in the streets, they were forced to disperse when soldiers were deployed to disband the protest camps. Violence escalated on May 19 during the final assault operation of the military which led to intense street battles, riots and looting. The retreating protesters also burned several buildings in the city, including the country’s biggest shopping center, the stock exchange, two TV stations and several banks. Scores were killed and more than 400 were injured during the clashes. Abhisit and some military officials were subsequently charged with murder for ordering the protest crackdown. Abhisit’s party lost in the parliamentary elections and he was replaced by Yingluck Shinawatra, the younger sister of Thaksin. Since her first day in office, Yingluck has been ridiculed by her political enemies of being a mere puppet of her fugitive brother, who is in exile after a local court found him guilty of plunder two years ago. She recently supported an Amnesty Bill, which critics believe would “whitewash” the crimes of her brother. The senate rejected the measure but it didn’t stop opposition forces from mounting large rallies in the capital last month. Last week, more than 100,000 protesters stormed the streets of Bangkok calling for the ouster of Yingluck and the end of Thaksin rule in the country. Meanwhile, the Red Shirts also mobilized to show support for the embattled leader. The ongoing protests highlight not just the deep political divisions in Thai society but also the unresolved issues that haunted the country when Thaksin was ousted from power. But while politicians vie for dominance, it is ordinary Thais who get hurt or killed in the street battles organized by the warring factions of the elite. Yellow Shirts lash out against Yingluck, Thaksin, and one unfortunate journalist.